NYU’s Leonard N. Stern School of Business program was initially founded in 1900 as the School of Commerce, Finance and Accounting. It was renamed in 1988 in honor of a $30 million dollar gift from Mr. Stern, who received both his undergraduate and MBA degrees from NYU. NYU Stern is accredited by the Association to Advance Collegiate Schools of Business. Today, Stern offers full-time, part-time, and executive MBA degrees. Stern’s part-time MBA program is known as the Langone Program, named in appreciation for a donation from Kenneth G. Langone, founder of Home Depot. In addition, Stern offers a TRIUM Global Executive MBA in conjunction with the London School of Economics and the HEC School of Management in Paris. Stern’s main campus is located in the Greenwich Village neighborhood of Manhattan. The “Westchester option” of the Langone Program is located north of the city on the campus of SUNY Purchase in Purchase, New York. The NYU Stern campus is located less than 10 miles away from the LaGuardia Airport in Queens, New York City. NYU Stern’s MBA programs center on the Henry Kaufman Management Center, located just off of Washington Square Park. The Langone Program’s Westchester option is located on the 550-acre campus of SUNY Purchase. The Stern School of Business employs around 170 tenured and tenure track faculty members and over 300 faculty members in total. 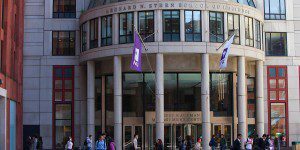 Roughly 20 percent of the NYU Stern faculty identifies as female. Approximately 399 students are enrolled in the NYU Stern full-time Class of 2019, which were selected from a pool of over 3,900 applicants. The current admissions rate for the business school is 21 percent. Among the Class of 2019, 38 percent identify as female, with 37 percent international students, and 29 percent minority status students. The average age of the class is currently 28, with an age spectrum of 21 to 38-years old. Enrolled students earned a previous GPA of 3.48 and average GMAT score of 714. Most enrolled students joined Stern with nearly five years of professional work experience. In addition to Stern’s large part-time program, the school hosts full-time, EMBA, Tech, and Fashion & Luxury MBAs.